This study investigates the influence of social and linguistic constraints on language contact through the analysis of linguistic borrowing from Spanish inthree indigenous languages of the Americas (Ecuadorian Quechua, Paraguayan Guaraní and Mexican Otomí). An extensive corpus for each language was collected and processed in search of loanwords and function words from Spanish. The analysis of the corpora was developed in the framework of the parts-of-speech theory and linguistic typology. In this way the study meets the requirements of a solid empirical foundation and a theory-driven approach. After an evaluation of the fundamental concepts of language contact, the author proposes a multi-level model of causation to explain contact-induced language change, in which linguistic and nonlinguistic factors interact with each other. The model serves as a point of departure to explain the interplay of social and linguistic constraints on borrowing. To support the language-specific analysis, an extensive description of the recipient languages is provided in terms of their historical development, sociolinguistic situation, dialectal variation and typological profile. The study confirms the dynamic nature of the causation model of contact-induced language change and the need to include specific typological, sociolinguistic and historical criteria in any evaluation of scales of borrowing and hierarchies of borrowability. Still, the major finding of the study is that not everything goes in linguistic borrowing: the outcomes are determined by the structural limits of the recipient languages and the resistance of basic typological parameters to change in contact situations. 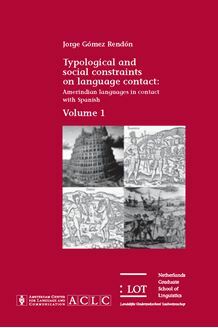 The study provides a new insight into the relation between linguistic borrowing, language typology and bilingualism, and therefore is of interest to typologists, sociolinguists, psycholinguists and those students of language contact and Amerindian languages.